October 23, 2012 – Of the more than 17,000 automobile dealers in the country, only 57 were nominated for the award, which will be presented Feb. 9 during the 96th annual National Automobile Dealers Association Convention in Orlando. The award, now in its 44th year, recognizes dealers that not only have built a successful business, but also those who have given back to the community. For DeLuca, community service is a duty. “That’s one thing I got from the founder of Southeast Toyota (distributor) Jim Moran. He said, ‘Frank when you can, give back to the community as much as you can and whenever you can, because if it wasn’t for the community you wouldn’t be here,’” he said. Success wasn’t assured. 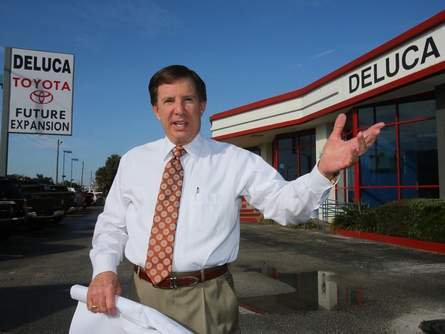 When DeLuca, 67, got the Toyota franchise more than 34 years ago, the brand was a new player in the automotive industry. The full article can be seen at the Ocala Star Banner by clicking here. Entry date: November 19, 2012, 4:36 pm. You can follow any responses to this entry through RSS 2.0. Responses are currently closed, but you can trackback from your own site.